2008 Aprilia ETV 1000 CAPONORD. Picture credits - Aprilia. Submit more pictures. Town, touring, and off-road, the CAPONORD rider can tackle it all. The CAPONORD boasts a sports engine in the form of Aprilia�s prestigious high performance 1000 cc V twin that has shown its mettle so well on Aprilia�s other maxi bikes. Ignition: Digital electronic ignition with TSI (Twin Spark Ignition) with two spark plugs per cylinder. Ignition timing integrated in the injection control system. DIAC (Dynamic Ignition Advance Control) electronically controlled ignition timing. Rear suspension: Aluminium alloy swingarm. Rising rate linkage with APS (Aprilia Progressive System). 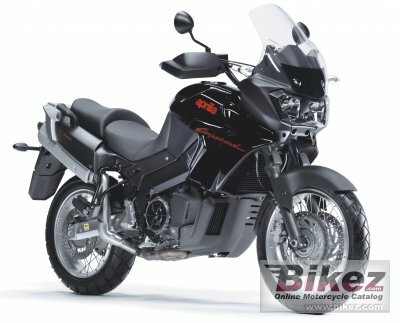 Ask questions Join the 08 Aprilia ETV 1000 CAPONORD discussion group or the general Aprilia discussion group. Get a list of related motorbikes before you buy this Aprilia. Inspect technical data. Look at photos. Read the riders' comments at the bike's discussion group. And check out the bike's reliability, repair costs, etc. Show any 2008 Aprilia ETV 1000 CAPONORD for sale on our Bikez.biz Motorcycle Classifieds. You can also sign up for e-mail notification when such bikes are advertised in the future. And advertise your old MC for sale. Our efficient ads are free. You are also welcome to read and submit motorcycle reviews.